I love trying out new recipes irrespective of the place. I still remember I was talking to my mother and was telling her about this blogging which I was doing. She asked me for how long I am going to keep blogging. I replied as long as I have the interest and as long as I think I can do justice to it. She was like if you don't get bored for say next 10 yrs, would you keep blogging? I was like, Oh yes I will if the life allows it. She started laughing and told me there aren't any recipes that will last me that long!!! Oh well, I have no idea about that but I know that my bookmarked recipe list is so long that I know its going to take a while to finish it and I am still adding more and more to the list! I just am not cooking it as fast as I am bookmarking the same. I will be a v happy and contended person if I can manage to cook at least 25% of that list! 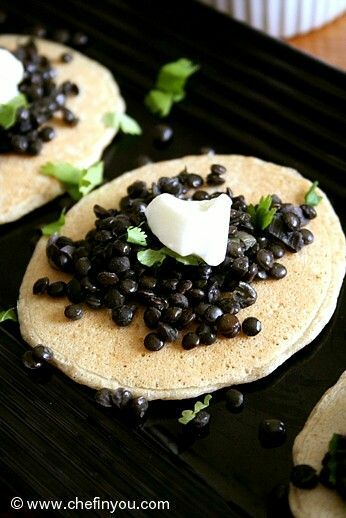 This time, out of the many "want-to-try" recipes, I finally took this recipe out - Buckwheat Blinis which I served along with Beluga Caviar. "What Beluga Caviar? - Did I hear it right?" - Oh yes! You did! Served it with the caviar since its traditional to the recipe so how could I have given it a miss now ;-) The recipe for the Caviar will follow next :) (smirking) This recipe is from a book called "Vegetarian" and I followed the instructions verbatim for the blinis. I gave their Mushroom Caviar recipe a miss since I was using the Beluga ____ Caviar. These were immensely soft, chewy with an amazing bready texture! 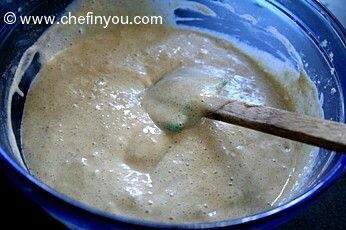 Who knew a pourable batter with yeast could make such a end result! 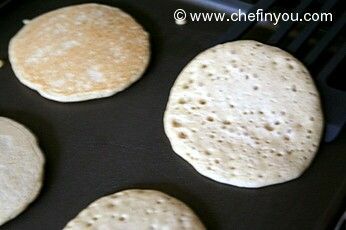 Well I know Ethiopian Injera goes through similar process ending in such a fabulous result but this took much less time.I LOVED blinis and I am sure going to make this again and again! Its not difficult and takes just few hours to put together. This makes a great party appetizer. 1. 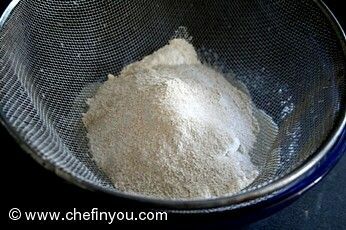 Sift the two flours along with salt in a bowl. 2. 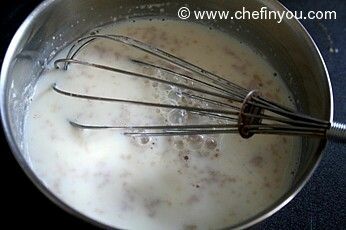 Warm the milk to lukewarm and add the yeast to it. Stir until well dissolved. 3. 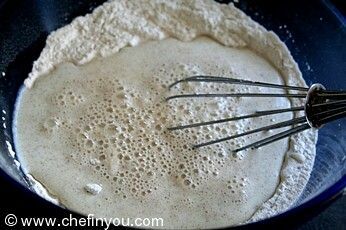 Pour it into the flour mixture. 4. 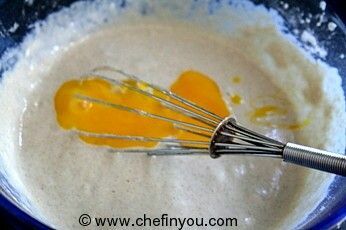 Add the egg yolks and stir to make a smooth batter. 5. 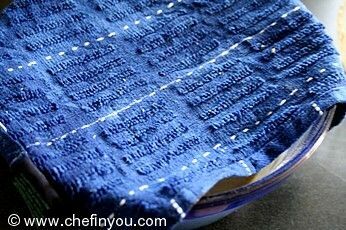 Cover with a damp cloth and let it sit in a warm place to rise for about 30-50 minutes, depending on the weather you enjoy. 6. It wont double up or something but will rise a little more than what you started out with. 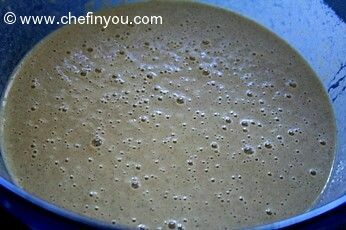 see all those bubbles from the yeast? 7. 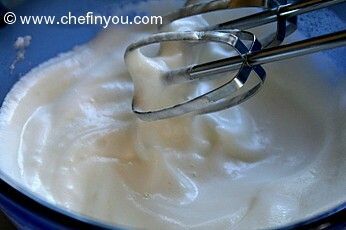 Beat the egg whites in another clean bowl until stiff. 10. 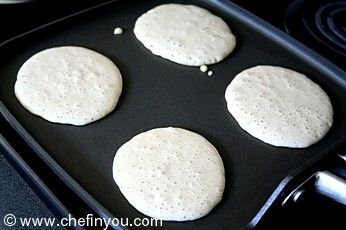 Heat a non stick pan or cast iron pan to moderate heat. Moisten with little oil. 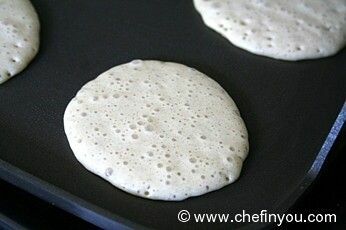 Drop spoonfuls of the batter (make v small rounds called Silver dollars which is about the size of two to three inches (5 to 7 cm) in diameter ) although I made mine a little bigger. 11. The surface is filled with lots of bubbles. Looks pretty isnt it? 12. Turn the other side when golden. 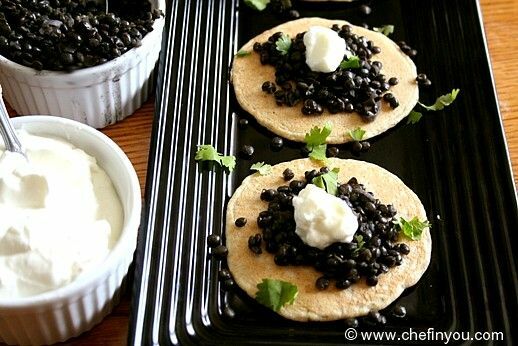 Top it with caviar and sour cream and Serve warm. Great for cocktail parties. if you are still wondering about how the heck I made Beluga Caviar and if I am telling a lie - Trust me! Its Beluga _____ Caviar. 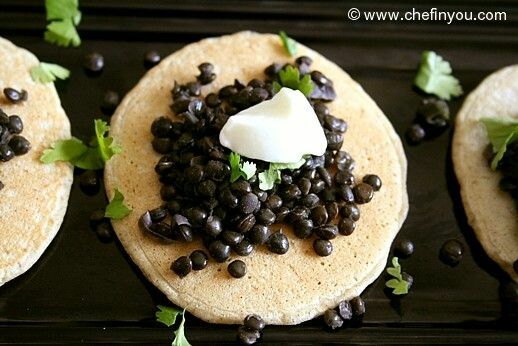 (yes its fill in the blanks which will be filled in later posts) This plate of Blini with caviar finds its way to A.W.E.D Russian hosted by dear RV :) Thanks for the wonderful theme RV! those are definitely lentils, you can see the little cooked red onion in there! 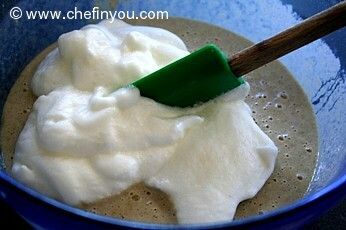 WOW nice recipe and lovely presentation!! I think there are recipes out there to last for a lifetime for us to try I believe, so keep on at it girl! 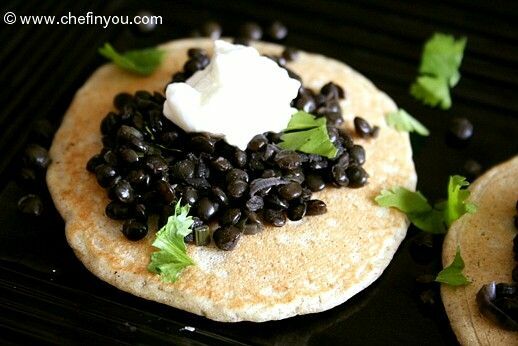 :) Blinis look yum, healthy too. 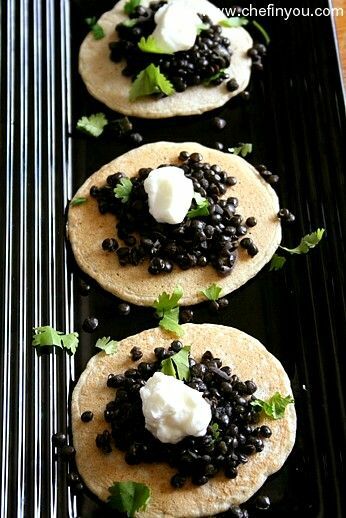 Beautiful blinis, thanks for sharing..